Publication | Advancing the Understanding of Storm Processes and Impacts – Matthew V. Bilskie, Ph.D.
Abstract In 2017, Hurricanes Harvey, Irma, and Maria caused more than $200 billion dollars of damage in the United States, as well as the incalculable cost of the loss of life and mental trauma associated with these disasters. In a changing climate, sea level rise and the potential for increasing tropical cyclone intensity can result in even more devastating damages. Therefore, engineers, community planners, and coastal residents need accurate, timely, and accessible forecasting of storm processes and their impact on coastal communities to bolster national resilience and reduce risk to life and property during these events. 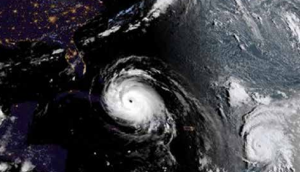 However, along with uncertainties in understanding and modeling of storm processes, there are complex challenges associated with determining and meeting the needs of end users who rely on these forecasts for emergency management decisions.